One of the biggest worries people have about living in a tiny home is the lack of storage space, but this is easily solved by choosing a floor plan with a walk-in closet! It's a great way to bring a feeling of spaciousness into an otherwise tiny living space. 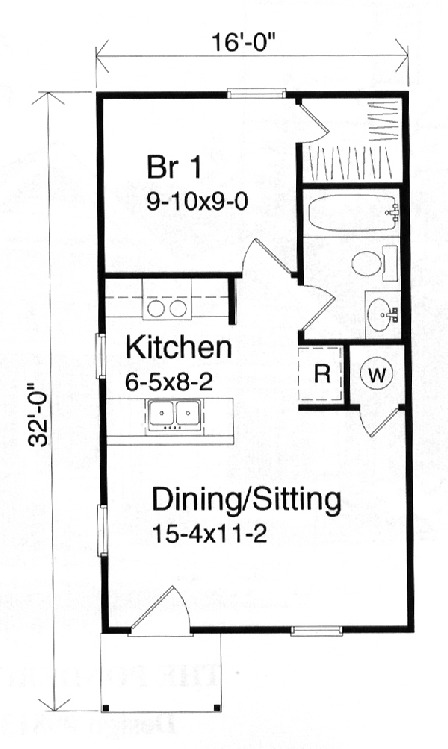 The following floor plans are small, but they've all managed to squeeze in at least one walk-in closet. If you're interested in building a tiny home, these plans mean that a lack of storage space is one less thing for you to worry about! 1. 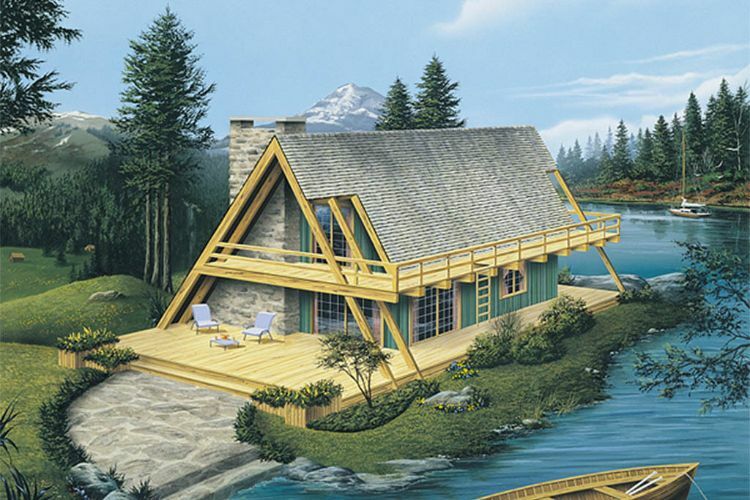 Narrow cabin from Houseplans. This clever design from Houseplans measures 966 square feet (90 square meters), and it would be absolutely perfect for a narrow lot. 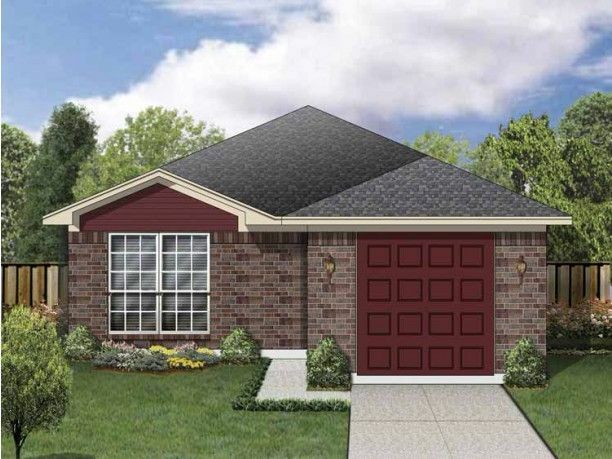 The front door opens directly into the family room, which features lovely vaulted ceilings. The kitchen and dining room are located right behind the living room, and behind the dining room are a pantry and a laundry closet. A door here leads out to a small back deck. Back in the family room, a door leads to a bathroom with a tub and two bedrooms; the master bedroom features a tray ceiling and a large walk-in closet. 2. 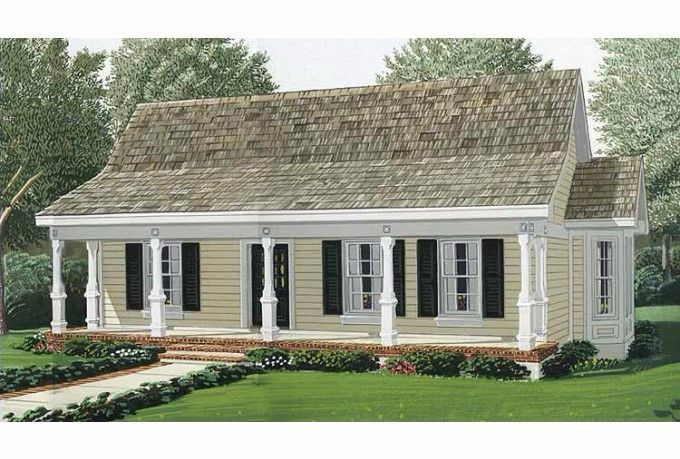 Cottage with large front porch from ePlans. 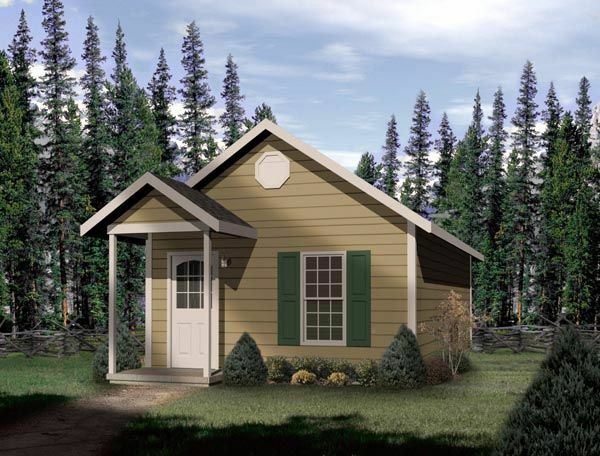 Coming in at 829 square feet (77 square meters), this cottage from ePlans has plenty of curb appeal. A covered porch spans the front of the home, and a door here opens into the main living area. The front portion of this space is taken up by the living room, while the U-shaped kitchen is right behind it. Off to the right, a dining nook is set in a charming bay window. The bedroom, bathroom, and utility closet are on the left side of the home. 3. Unique vacation home from Houseplans. Coming in at 865 square feet (80 square meters), this unique design from Houseplans has plenty of interesting features. The house features a large wraparound deck and a door at the back of this deck leads into the kitchen. From here, you can continue straight through to get to the living room, which features two fireplaces side-by-side. Turn the corner, and you'll find a laundry/utility closet, a coat closet, and a bathroom with a tub. Upstairs, two bedrooms share access to a walk-in closet. 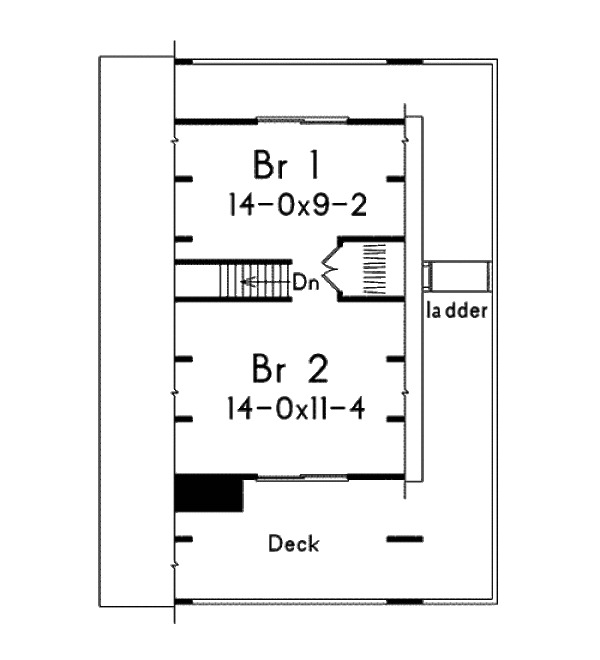 There is a wraparound deck on this level as well, and it can be accessed via either sliding glass doors in the bedroom or a ladder that leads up from the deck below. 4. 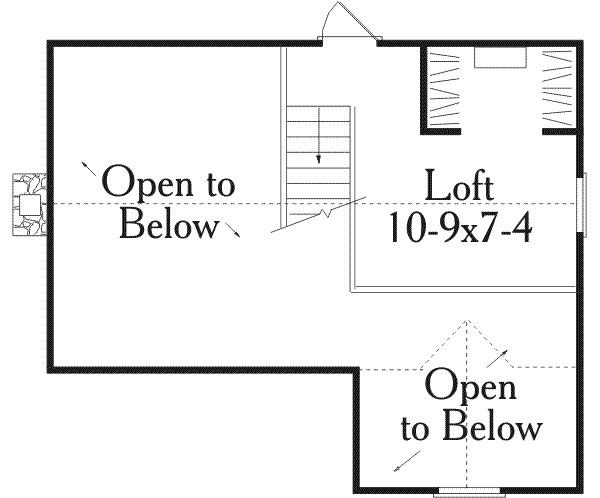 Simple one bedroom design from Family Home Plans. This tiny house from Family Home Plans comes in at 448 square feet (42 square meters) - just the right size for one or two people! A dining/living room combination is found at the front of the home, and the kitchen is behind it on the left-hand side. The bedroom and the bathroom can both be easily accessed from the kitchen area. Of course, there is a walk-in closet on the right side of the bedroom. 5. 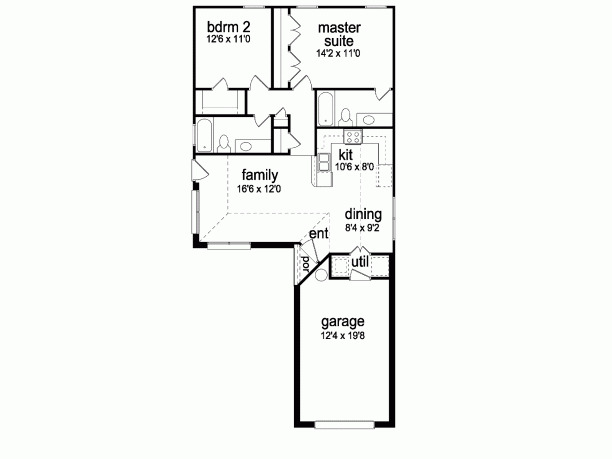 Two-bedroom New American home from ePlans. 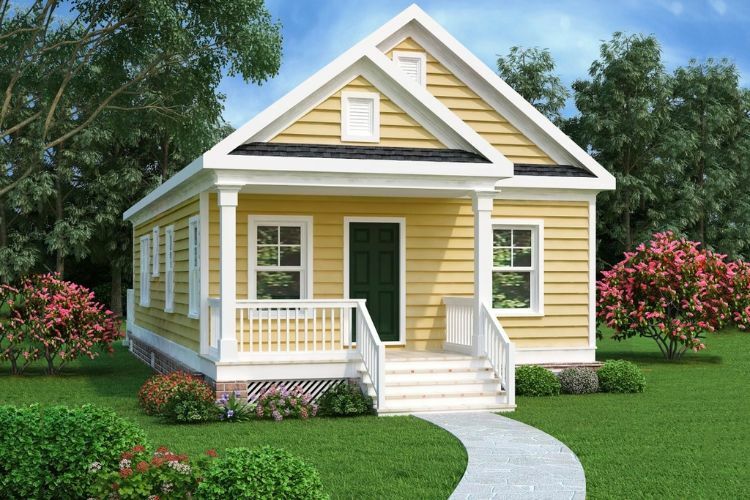 This design from ePlans measures 973 square feet (90 square meters), and it includes a convenient single garage at the front. The home can be entered either through this garage or through the front door, which is directly beside the garage on the left. From the front entryway, you can choose to either turn right to access the dining room and U-shaped kitchen or to turn left to access the living room. 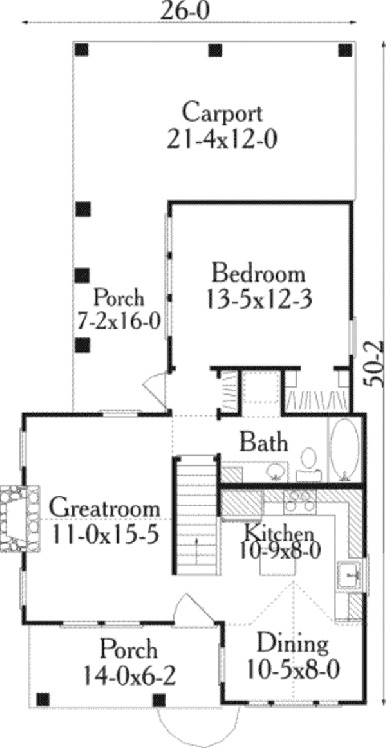 A hallway off the living room leads to two bedrooms and two bathrooms, both of which have a tub. 6. 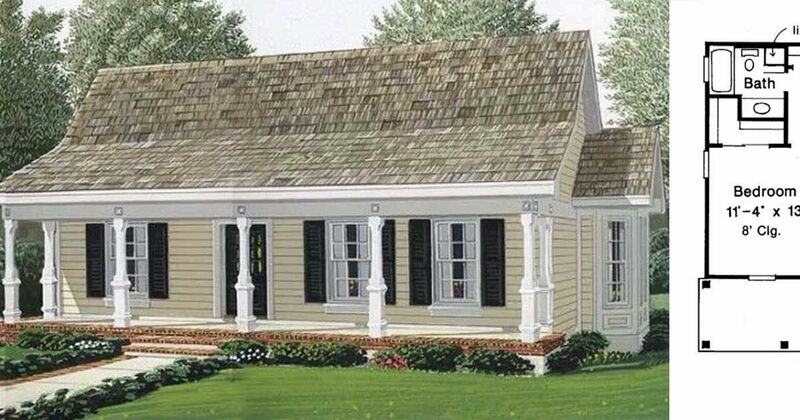 Charming farm house from Houseplans. 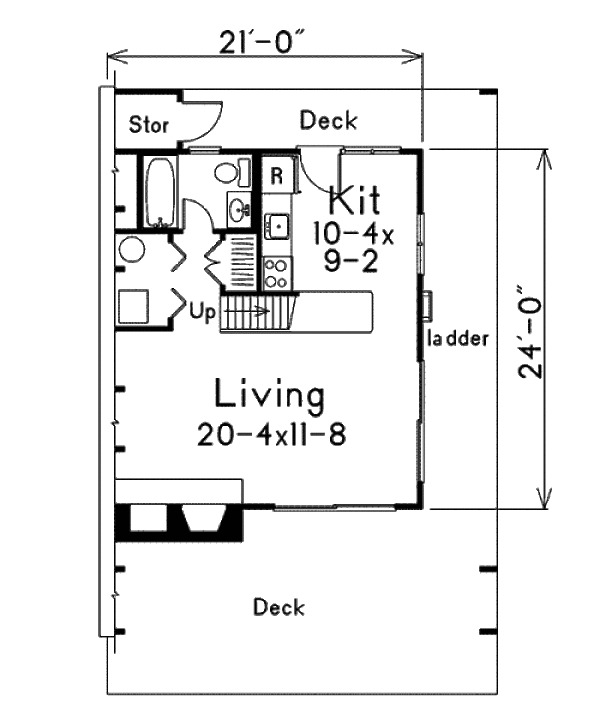 At 852 square feet (79 square meters), this design from Houseplans has not one but two walk-in closets. Once inside the front door, the dining room and L-shaped kitchen are off to the right while a great room with a fireplace is on the left. A bathroom with a tub is just around the corner from the great room, and the bedroom is right behind it. Upstairs, the loft in the back right corner also has a walk-in closet and is open to the living space below on two sides. 7. Craftsman with columned entry from Floorplans. 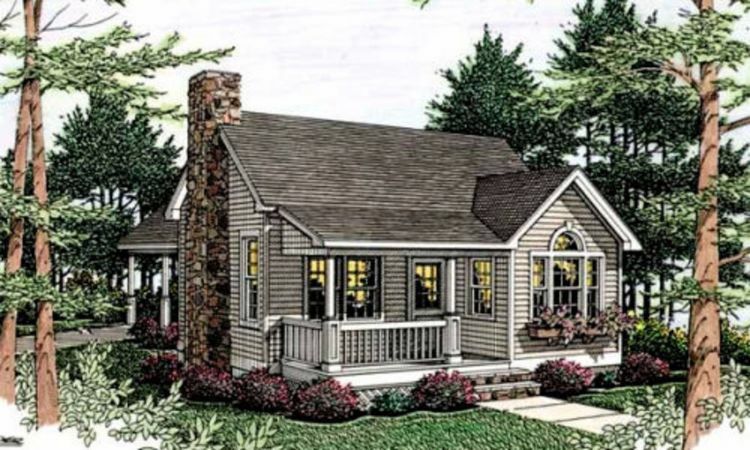 This lovely little Craftsman from Floorplans comes in at 697 square feet (65 square meters). 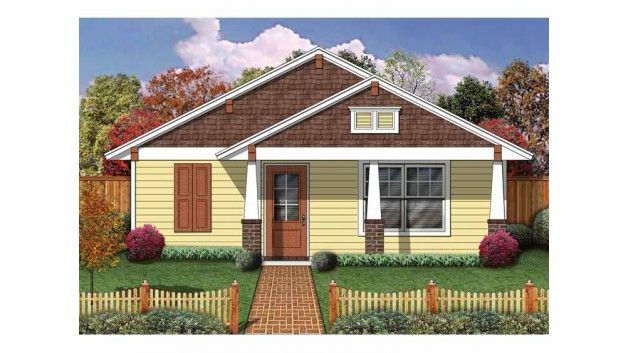 The front door is located under a good-sized covered front porch, and it opens into a small entryway with a coat closet. 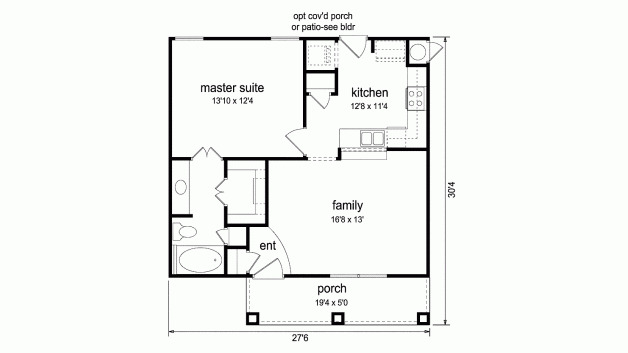 The living room is directly to the right of this, and the kitchen can be found behind the living room. The rest of the home is taken up by the master suite, where double doors int the bedroom lead into the bathroom. The walk-in closet is right across from the sink. A-frames typically come with lofts that make them excellent family homes, but the sloping roofs also mean that there is plenty of leftover space that's ideal for using as storage. 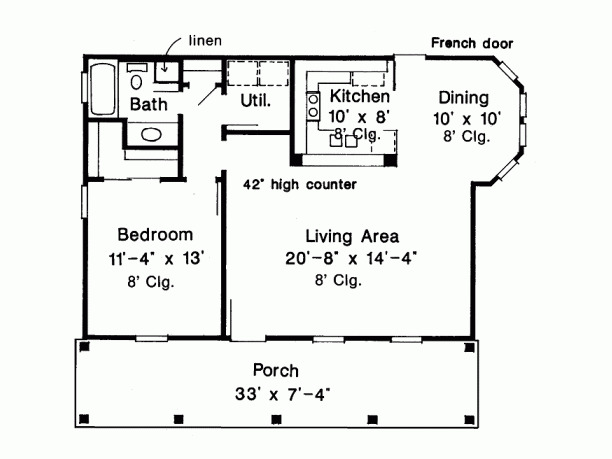 The following floor plans demonstrate this perfectly! Natural light is every home owners dream. Windows, lots of them, is the way to fulfill that dream. Whether you choose a contemporary wall of glass, or subtly inject light using dormer windows or skylights, where there's a will, there's a way.